I recently posted my first photos taken with the nauticam CMC macro wetlens using stalked jellyfish as a subject. I since lost my lens, which I in large part blame on the bad fit of the adapter with which it is attached to the housing. The best thing in these cases is not to agonize over it too much, order a new one straight away and keep going, so that is what I did (also I am now a bit more careful of course). Here some more photos of macro subjects. Above a very easy subject as it is very common this time of year and also it does not move….Paddle worm egg capsules (probably Eulalia viridis). The individual eggs can be just made out in the gelatinous blob. Below, one of the more common nudibranch species Polycera quadrilineata. Nudibranchs come in all kinds of stunning colour variations and are very species rich and so are a favourite of macro photographers (see this old post hunting for them with David Fenwick in Newlyn, and check out the NE Atlantic Nudibranch facebook page for lots of eye candy). Tricky with the narrow depth of field to get the whole animal in focus. Mysid shrimp are quite common and beautiful little animals hovering about in small groups. They need dissection to determine which species it is, but this might be Leptomysis lingvura (around 10 mm). Finally, the colonial star Ascidian Botryllus schlosseri; these form colonies (‘systems’) where zooids have individual inhalant openings and a shared exhalant opening. They are common, sessile, flat, and come in a range of colours so they make ideal subjects for a beginning macro photographer. Not only that, apart from fish they are our closest relatives in rock pools, which is most obvious in the tadpole-like larvae which have a dorsal notochord (a cartilage rod functioning as a backbone). I hope to devote a post to them later in the year. OK, it was the plan to post a general Falmouth seaweed/rock pool photo post every month but I am faltering the second month in… It is not for lack of trying, because I have been sneaking out of the office quite a bit, but the weather has been pretty awful. Lots of wind, choppy waves, rain, cold and bad viz. I had one good day this week and I am posting some of the better pics from that session. 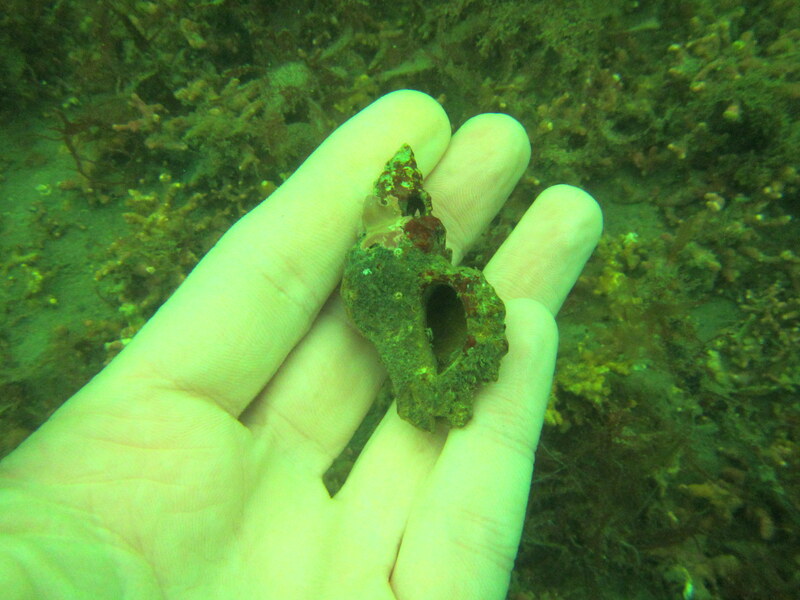 Again a photo of Nursehound mermaid’s purses attached to Bushy rainbow wrack, pretty much the only seaweed species these sharks use to attach their egg cases to. 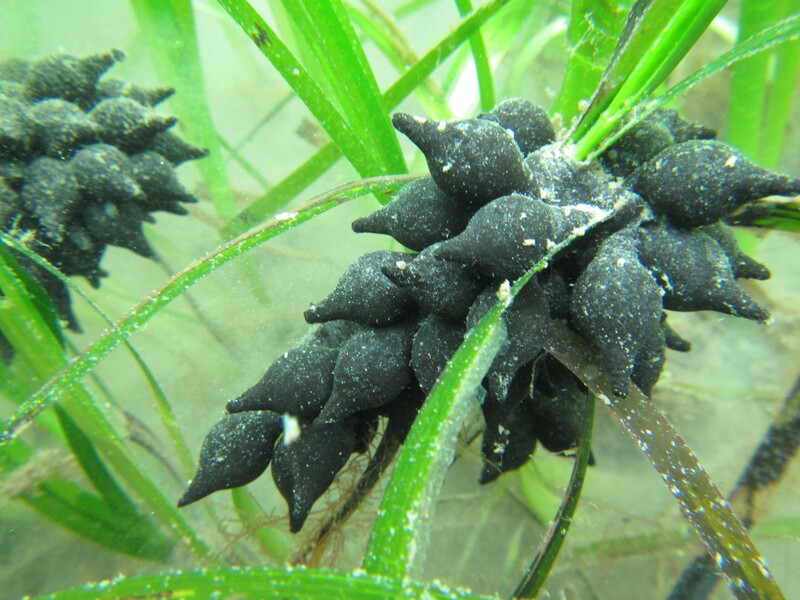 This must be because this seaweed species is very sturdy, and especially because it is a perennial: the eggs can take up to twelve months to hatch! 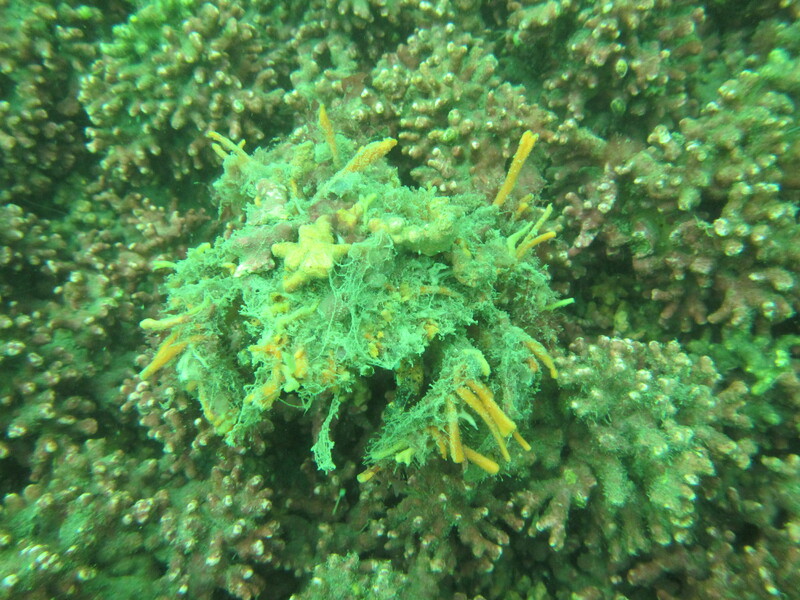 Below three more Bushy rainbow wrack Cystoseira tamariscifolia photos. 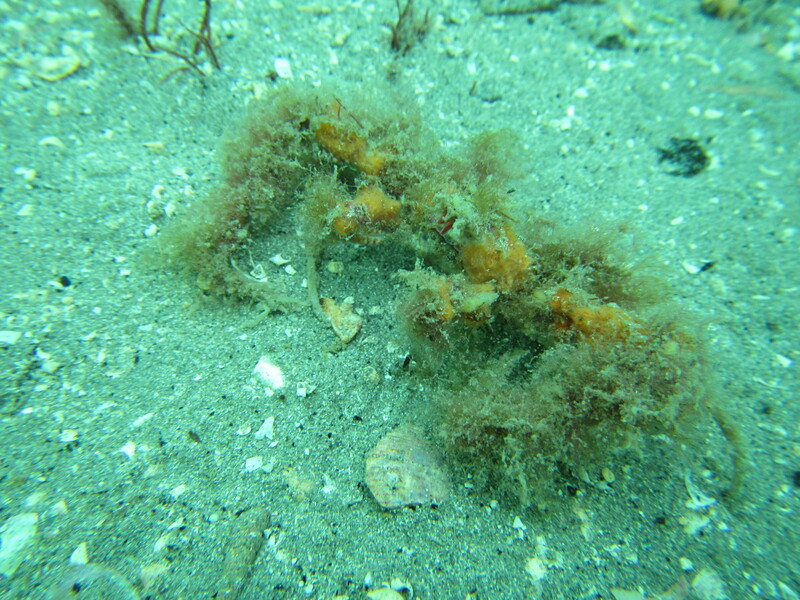 The first photo shows a short plant with few epiphytes but the following photo shows that this species is an especially great substrate for all kinds of other seaweeds, including Harpoon weed, Fern weeds and Juicy whorl weed. The plant in the third photo (unfortunately out of focus) is completely covered by a beautiful flat red species: Above a general impression of the scene before the sun reappeared. Btw, most of the photo’s have not been post-processed but some I have tweaked a little using the standard photo editor that comes with Windows 10, which is actually really good. The seaweeds have been growing quite a bit since January. A few have become more prominent, such as Slender wart weed Gracilaria gracilis (first two photos) and (I am not 100% sure) Purple claw weed Cystoclonium purpureum in the two photos after that. I have a bunch more photos that show different seaweed species, but I hope that I can take better pictures of these later this month for a follow-up post (I am trying to find a balance between showing what I have seen and posting ‘good’ photo’s, which is a bit tricky!). I have a macro lens now as well, which I will mainly use for animals but also can be used for the smaller seaweeds; the last photo is a first attempt. I have been a bit busy and so the photos below are some weeks old. The seaweeds are in decline already it seems. Actually, that is not true, there are plenty of seaweeds growing, but some of the prettier ones are dying off and some of the uglier ones are taking over. The window to take the nicest rock pool shots is quite short, pretty much early spring only. The ubiquitous False eyelash weed Calliblepharis jubata is yellowing, the green Sea lettuce Ulva lactuca is starting to cover everything and the Red grape weed is getting ‘fluffy’. Not the best session photo quality-wise and probably the last of the year. The Bushy rainbow wrack Cystoseira tamariscifolia is abundant and looking good (on the photo with Discoid forkweed Polyides rotundus) and I managed I nice shot of young Thong (or Spaghetti) weed Himanthalia elongata. I have done some more research into ‘proper’ underwater cameras and was tipped of about the Canon G16 (thanks Thomas from HydroMotion Media), maybe something for next year…. The past couple of times when focusing on the seaweeds I also encountered some animals (it is hard not to). Many Snakelocks anemones Anemonia viridis, with some having very short tentacles. 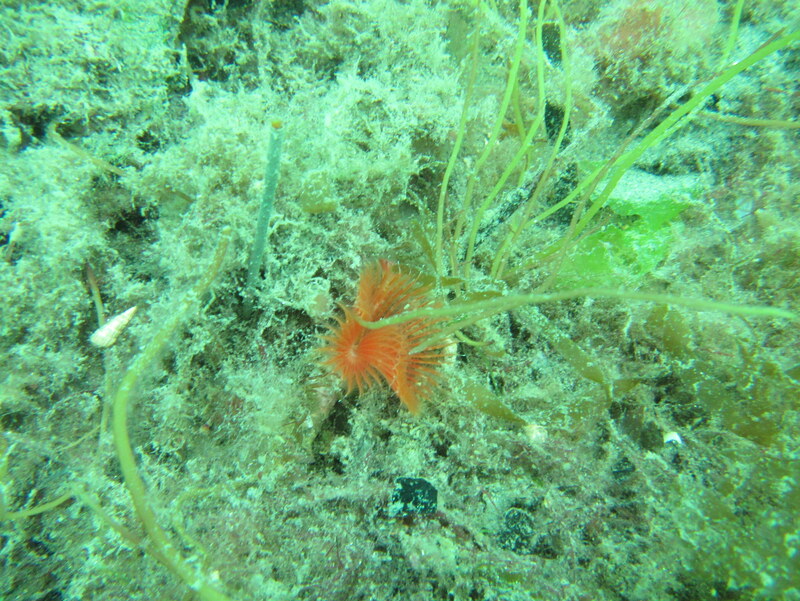 Next, a Decorator crab Macropodia rostrata covered in Banded pincer weed Ceramium. Mermaid’s purses (egg cases) of the Bull huss/Greater-spotted Dogfish/Large-spotted Catshark/Nursehound Scyliorhinus stellaris seem to be exclusively attached to Bushy rainbow wrack. 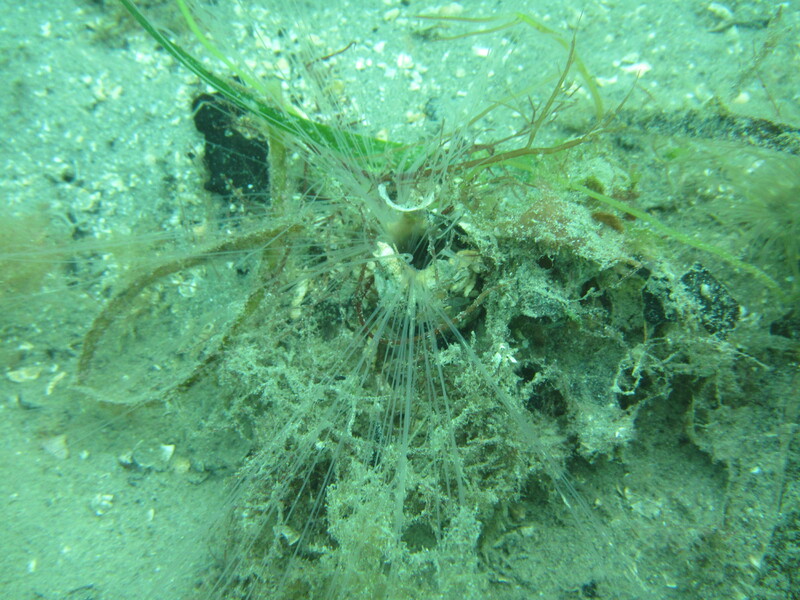 Finally, a Stalked jellyfish Haliclystus octoradiatus on Wireweed Sargassum muticum. Sunday was a beautiful spring day and we headed out to a new spot: Sandy Acres Beach on St. Ives Bay, North Cornwall. Beautiful dunes and a vast beach with very few people on it! With the kids running amok, I had only very little time to scour the high tide strand line. However, even with only 50 meters or so covered, it was the best bit of beach combing so far. Many cuttlefish bones, bits of Horn wracka and quite large mussels covered in seaweed holdfasts. Below a quick snap. At the bottom, I am not 100% sure, two Thornback ray Raja clavata- a Spotted ray Raja montagui and just above that a tiny Small-spotted catshark Scyliorhinus canicula mermaid’s purses (egg cases, see here for a useful key). Next to the mussel Mytilus edulis, some Hornwrack Flustra foliacea (a Bryozoan), two sponges which might be Mermaids glove and Chocolate finger sponge (thanks Steve Trewhella at the Beachcombing facebook group) and a spiky piece of Sea beard Nemertesia antennina, a hydroid. 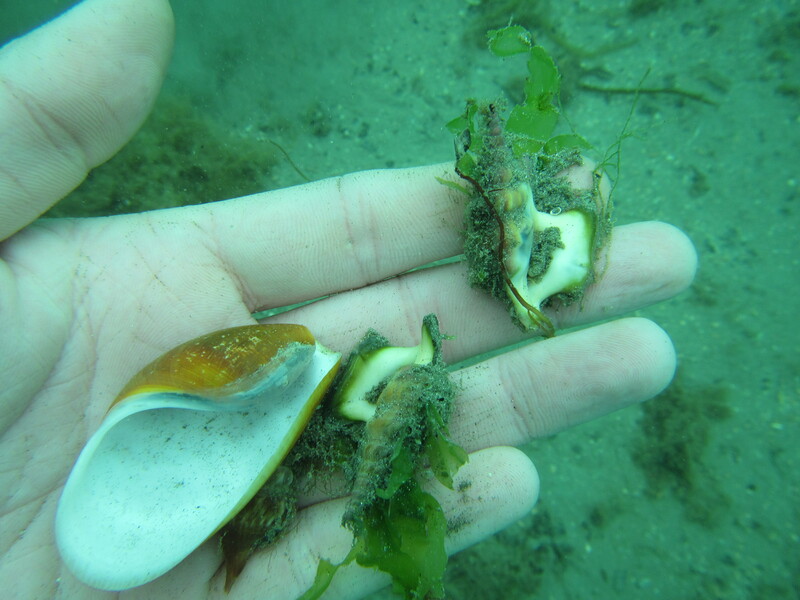 At the right of that a piece of a whelk Buccinum undatum egg cluster (better pic here). Not a bad haul, looking forward for a proper walk along this beach very soon! This friday, I tried my hand at some more underwater rock pool photography with my point-and-shoot Canon Powershot (see also here and here). This is both rewarding as the colours of seaweeds are so vivid and the textures so varied, and frustrating, as I cannot use the viewfinder and even if I could, lots of shots would be much better using a wider-angle lens. Also, I am often kicking up silt with my wellies and the nicest shots often are just out of reach. 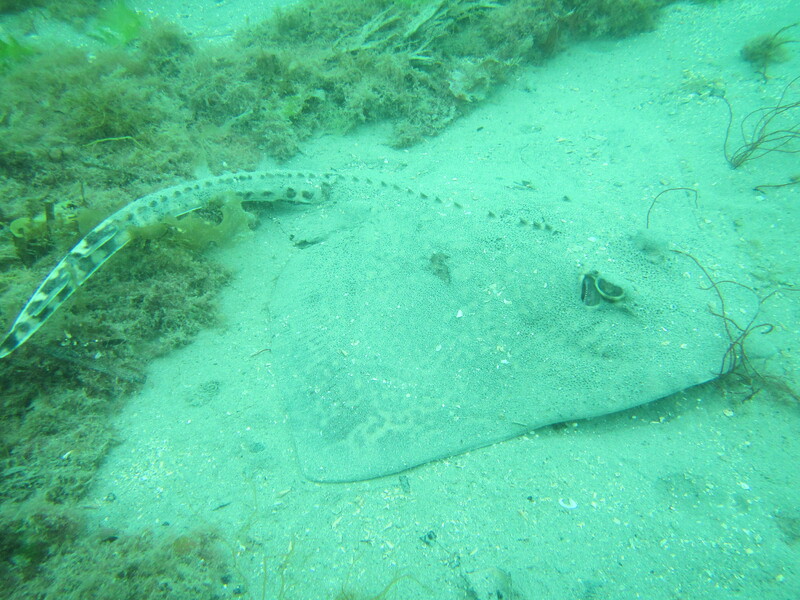 So next time, I should really photograph whilst snorkelling. (It would be great to use an SLR in an underwaterhousing. I bought a much cheaper and much more cumbersome ‘underwater-camera bag‘ without remembering that my old, not-so-frequently-used-anymore Canon EOS 400D does not have a viewfinder. I am afraid this will make the experience less, not more, fun…) Anyway, the trick for now is to take many pics and hope some turn out all right. I like the ones with a water surface reflection best. 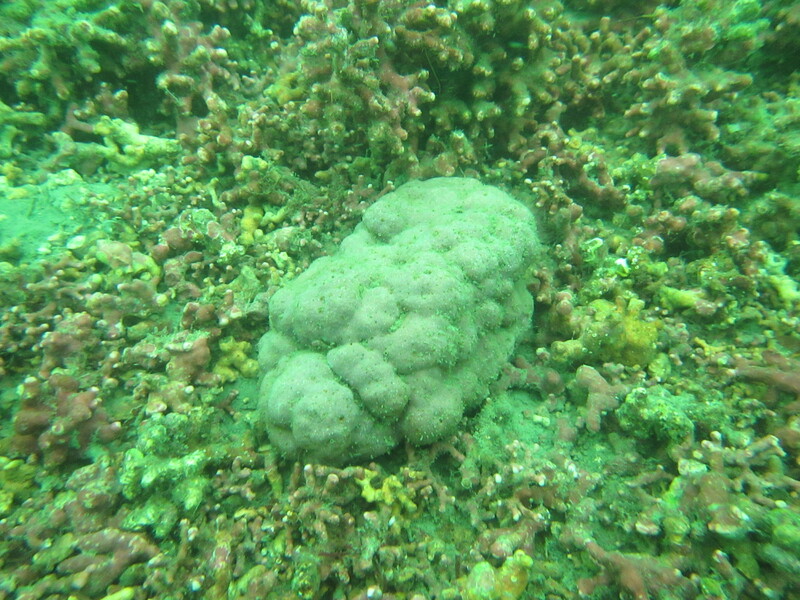 The nicest one was a snakelocks anemone among corraline algae. Next, what is may or may not be Sea flax weed Stypocaulon scoparium. After that, the brown Divided net weed Dictyota dichotoma growing inbetween Discoid fork weed Polyides rotundus, a Bull huss/Nursehound/Large-spotted dogfish Scyliorhinus stellaris mermaid’s purse and a Spiny starfish Marthasterias glacialis. Probably more photos soon as the pools look by far the best in early spring. The weather was not great last weekend and we were too late at the diveshop on Saturday to be back in time to get the tanks refilled for a dive on Sunday but the one dive was (as always) worth the effort! 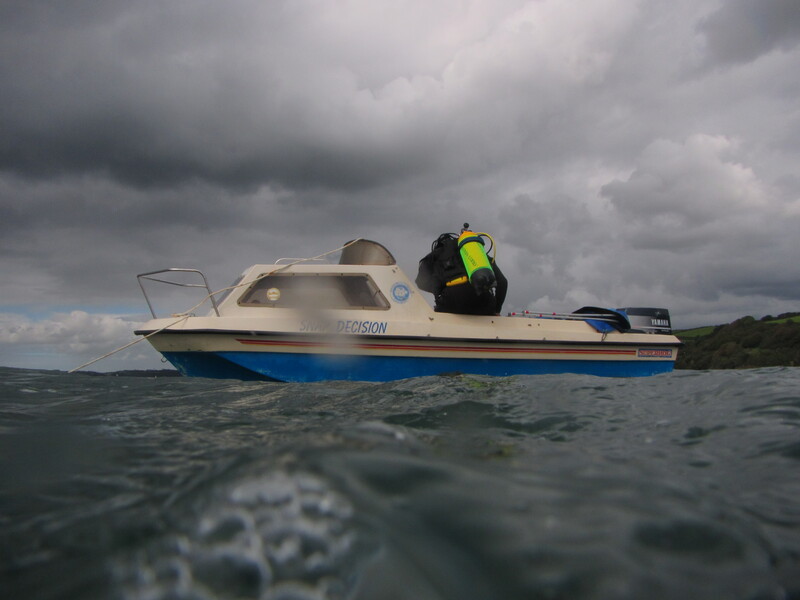 We took dive buddy Chris’s boat from Loe Beach in Feock over to the other side of the Fal Estuary (between St. Just and St. Mawes) to explore the Maerl beds. 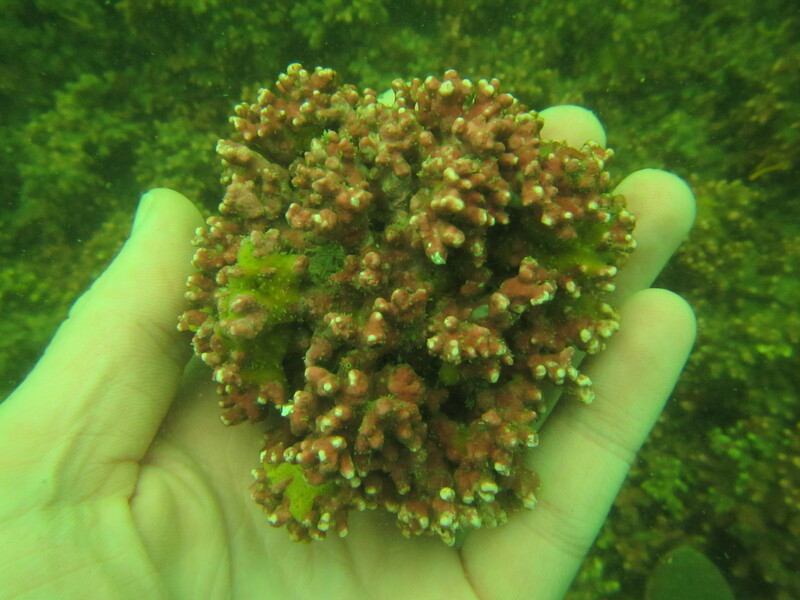 See an earlier post on a snorkel trip to see this bed of ‘Cornish coral’ for some more background information. After the usual faffing about with equipment on board we plunged in the water. I took a single photo of the boat which turned out quite dramatic: Although we were diving 1-2 hours before high water (the best time, as clear seawater is pushed in the estuary), the visibility was quite bad. After going just a couple of meters down, fields of maerl loomed into view (the dive was really shallow, 5.9 meters max I think!). There were quite a lot of Thornback ray Raya clavata egg cases (foreground first picture) but we did not see the rays themselves. There are two main Maerl genera around here, Phymatolithon and Lithothamnion but their growth forms are varied and there are other encrusting Pink paint weeds that could look similar. 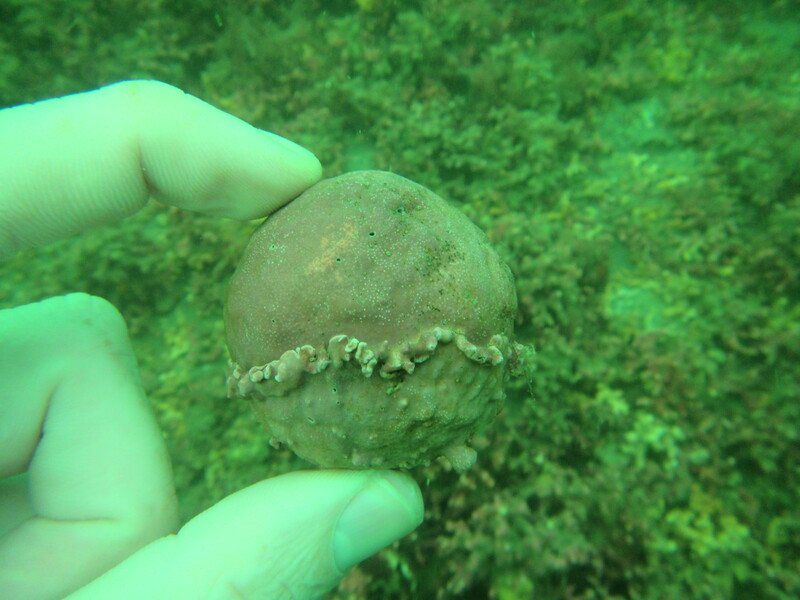 We saw a number of golf balls that were completely covered in coralline algae, quite cool. We saw a couple of *very well* camouflaged crabs sitting about. 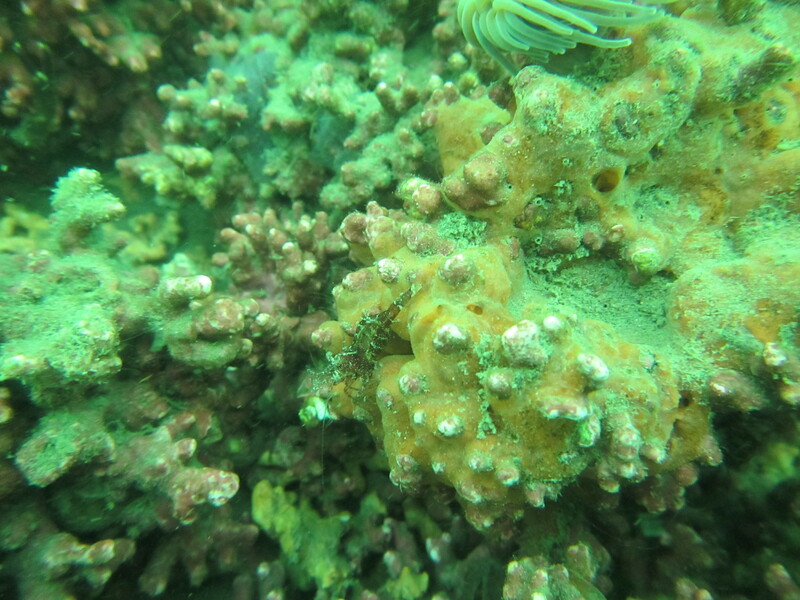 They were completely covered by sponges, coralline algae and seaweeds. There are a number of crab species shaped like this but most of them seem too small. Best guess is the Toad crab Hyas coarctatus the Europan spidercrab Maja squinado in a particular extravagant mood. There are lots of little things hiding in the Maerl; gobies (rock gobies I think), squat lobsters, swimming crabs, hooded prawns and things that hide faster than I can identify them. I noticed a dainty little prawn sitting about which is probably Thoralus cranchii, although it could also be Eualus occultus (second picture is cropped). 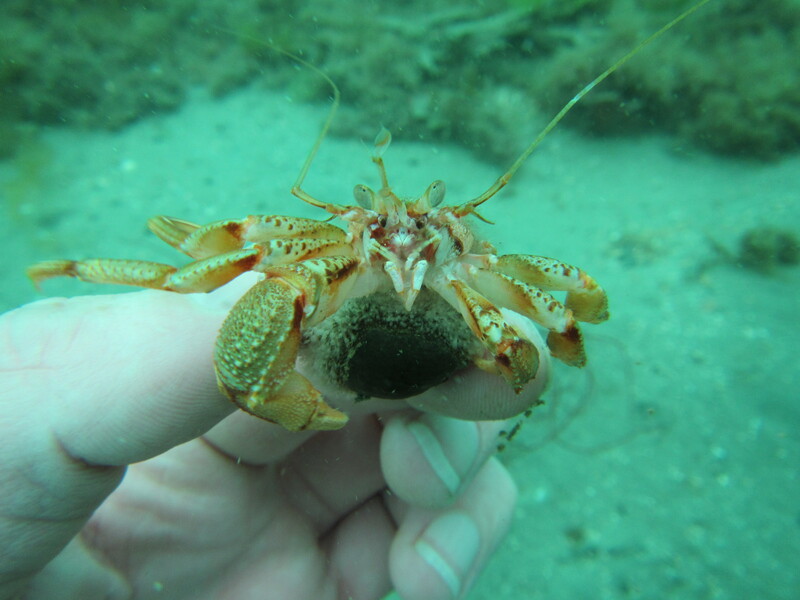 Swimming crabs were common and probably mostly were the Harbour crab Liocarcinus depurator. The first picture was the only one with flash and shows the Maerl colours a bit better. 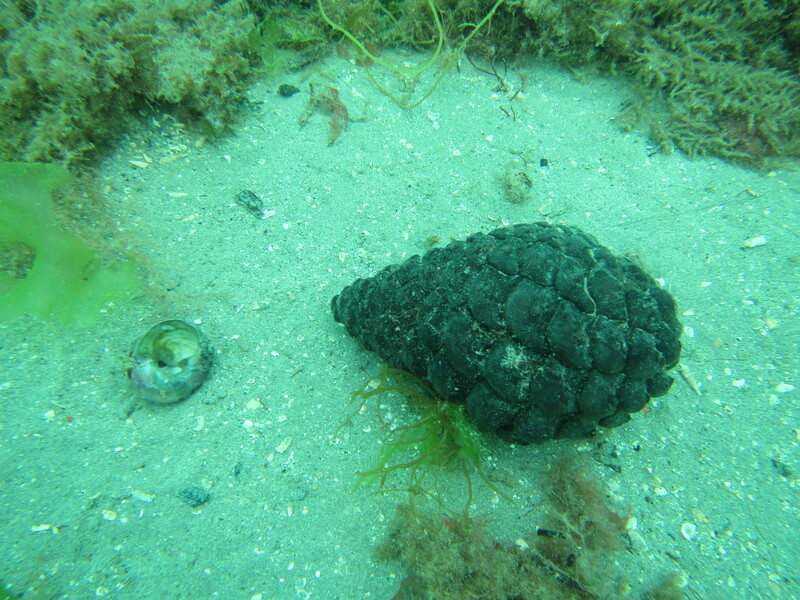 The second photo shows a Velvet swimming crab Necora puber under a snakelocks anemone sitting on top of a bottle. 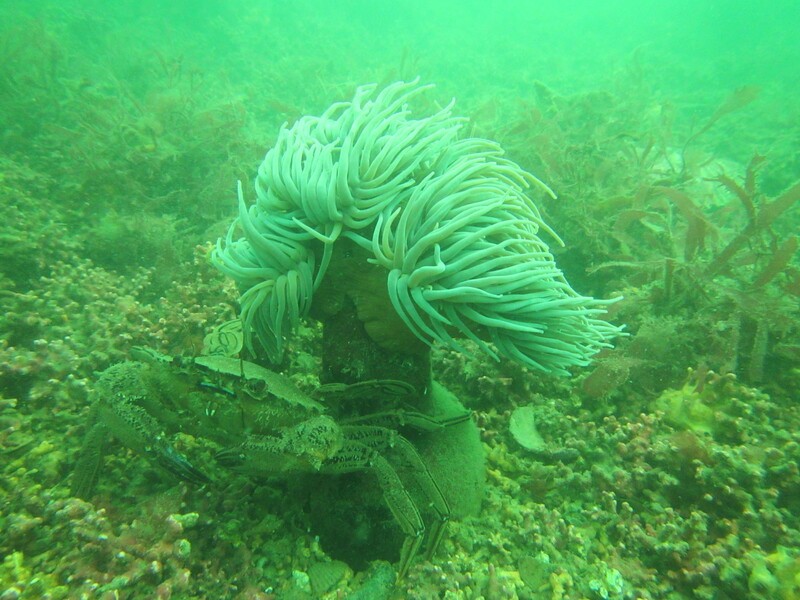 This species can be very commonly seen rockpooling. 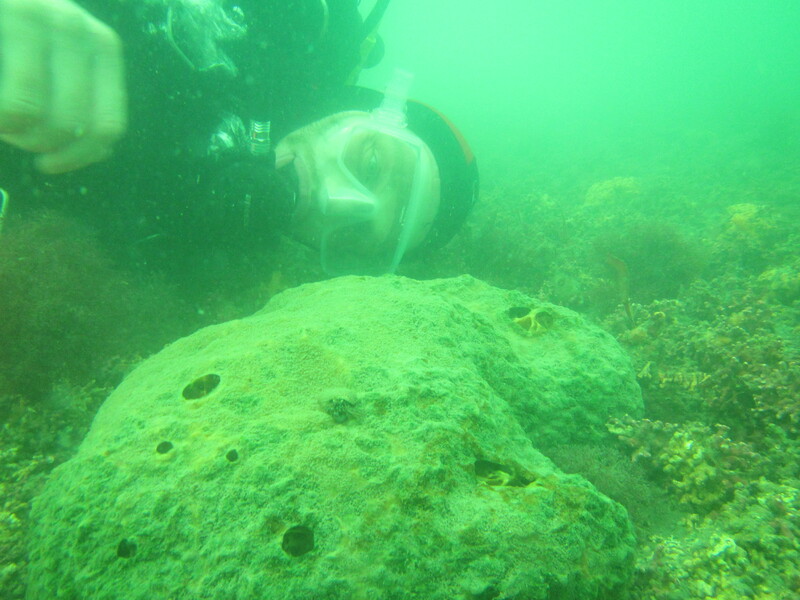 Lastly an empty shell of the largest European sting winkle Ocenebra erinaceus I have seen so far and probably the largest sponge I have seen so far too (with a human head for scale). After the success of last weeks snorkelling session, it was high time for a proper dive! Again the Helford did not disappoint. 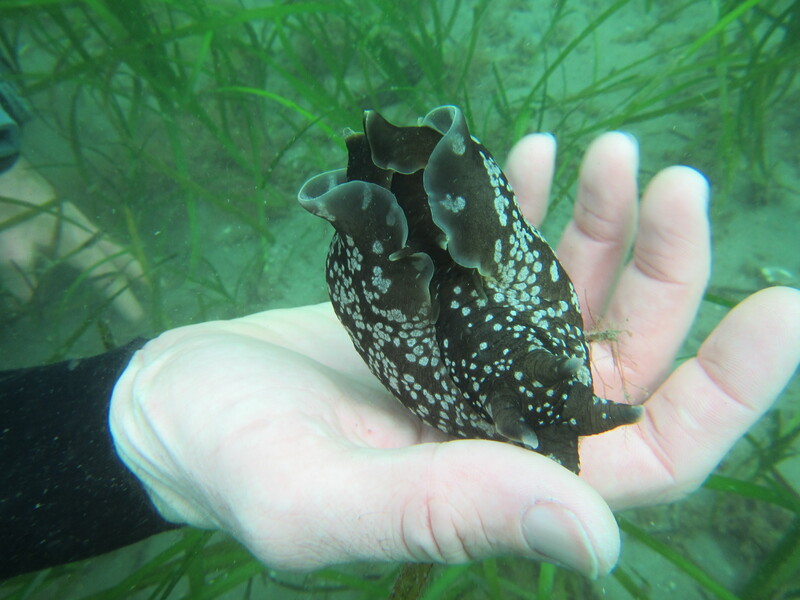 In the end, my Sea hare stroking proved a bit inconclusive; also, my estimate of 30 cm long individuals might have been a slight exaggeration, 20-25 cm is more likely for the larger individuals. My guess is that it might be Aplysia punctata after all, and perhaps this is just a very good year where they reach their maximum size. (Note that three individuals can be seen in the first photo and two in the second photo.) 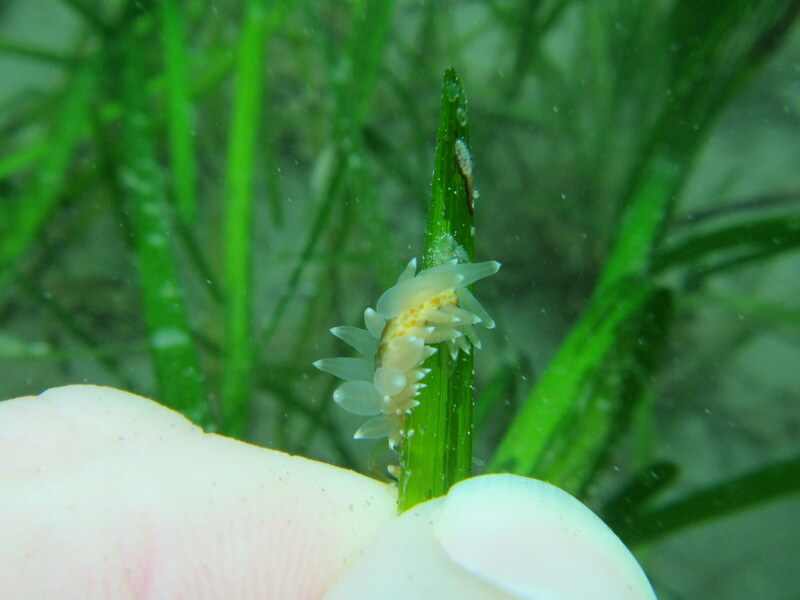 This was not the only Ophistobranch activity going on, as I spotted a small nudibranch sitting on the eelgrass. Probably Eubranchus farrani, although it could well be something that is deserving of a new name, there is a lot of (cryptic) species discovery and taxonomic revision ongoing in nudibranch biology. 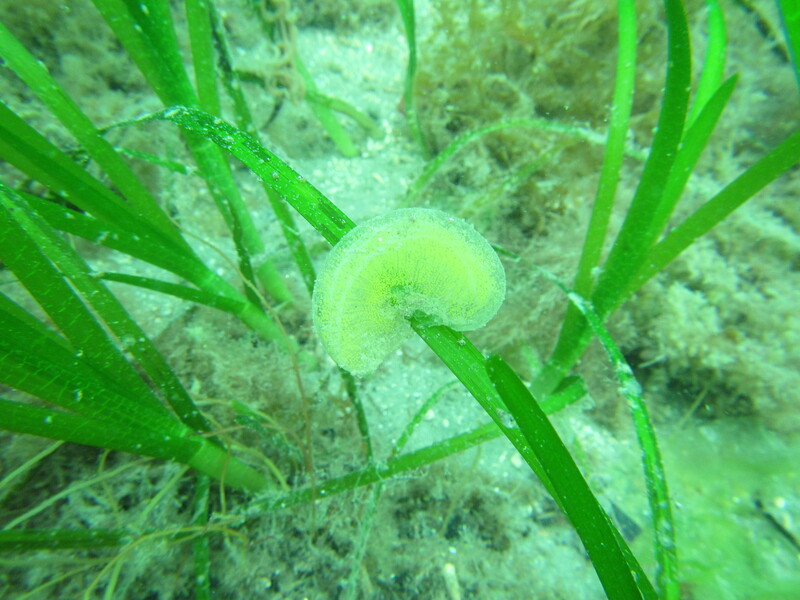 I also spotted several largish egg masses on the eelgrass that are likely to be from a larger, shelled Ophistobranch; I am waiting for suggestions from various facebook groups *could be Haminoea navicula*. I found a beautiful Wooden canoe bubble shell Scaphander lignarius, these animals live buried in the sand so are not commonly spotted. Next time I’ll bring a small garden rake to see what is hidden below the sand (I am serious! ), lots of echinoderms and molluscs to be sure. Pelican’s foot shells Aporrhais pespelecani live in sand, but I found some on top of the sand too, so full of muck that they were barely recognizable. I have found empty shells of this species washed up on holidays before, but it was cool to see them alive for the first time. No cuttlefish in sight this time, but loads of eggs so it is likely that this is an important breeding ground for this species. 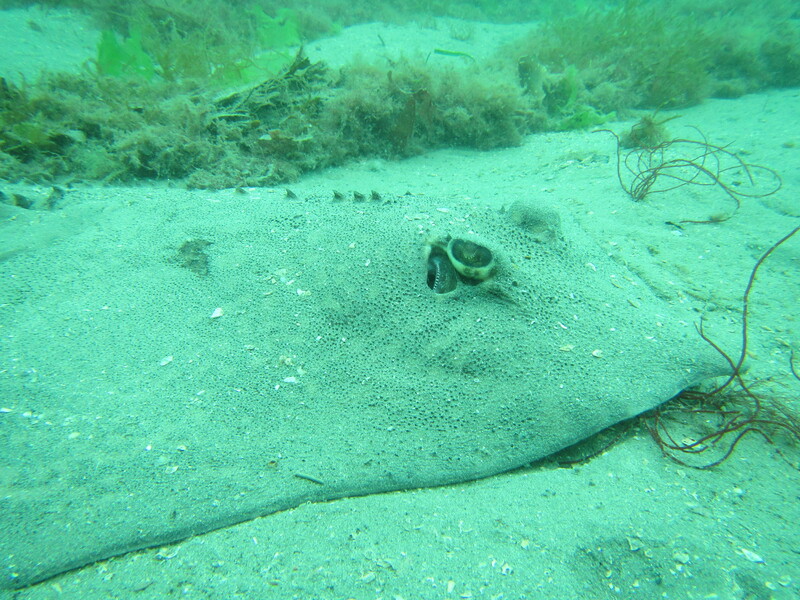 We encountered one Thornback ray Raya clavata, which, like cuttlefish, are not very shy. 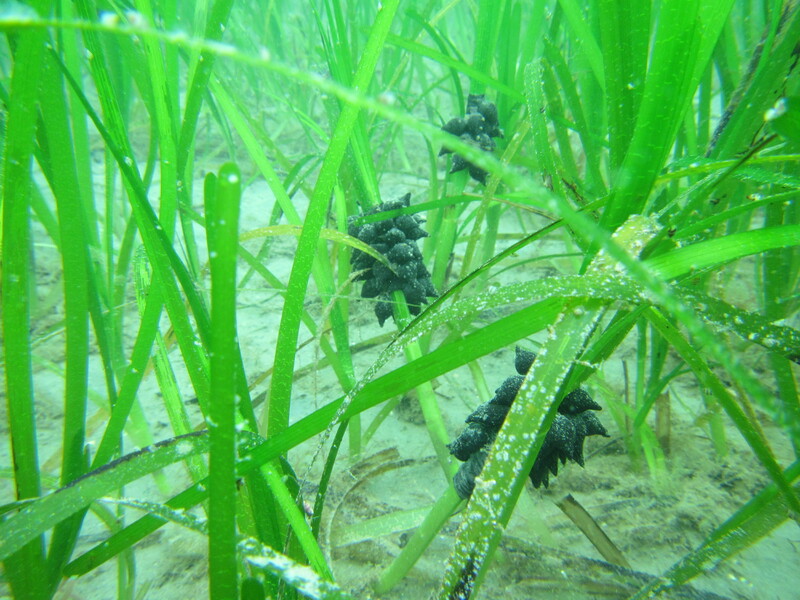 These species occur in very shallow waters (we probably did not dive deeper than 7 meter) and the influence of the surrounding woodland is clear, with decaying oak leaves and pine cones amidst the seaweeds and eelgrass. 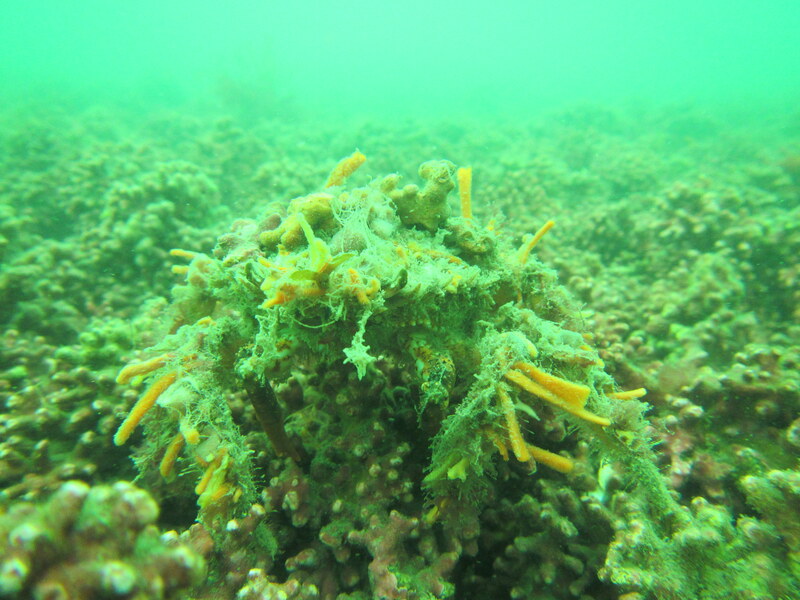 One very well-camouflaged species is the Scorpion spider crab Inachus dorsettensis. Medium-sized Common hermit crabs Pagurus bernhardus are common, running around in Turban top shells covered with hydroids. Although present in the last post, another pic of a Mud sagartia Sagartia troglodytes anemone Red speckled anemone Anthopleuris ballii. 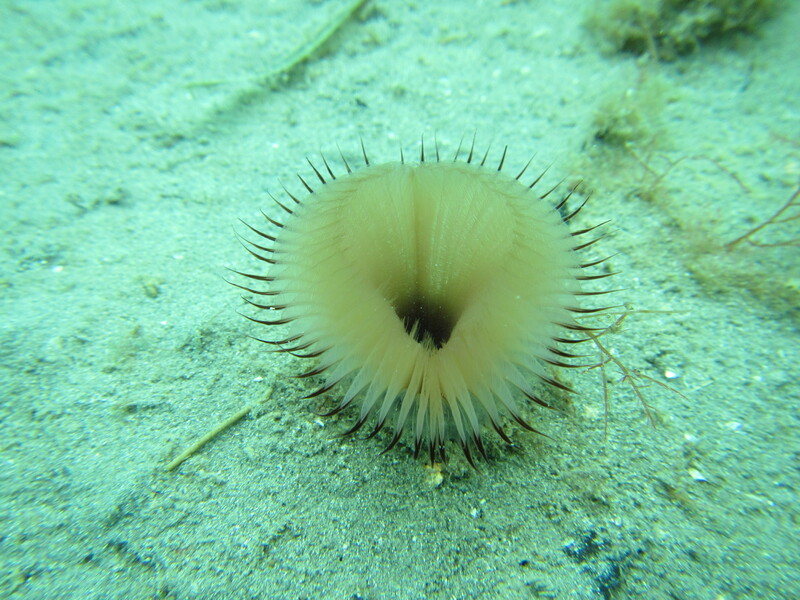 Filterfeeding worms are abundant too, including the beautiful Fan worm Myxicola infundibulum as well as a large tube-dwelling worm and worms in white calcareous tubes with bright red bristles that I could not identify. 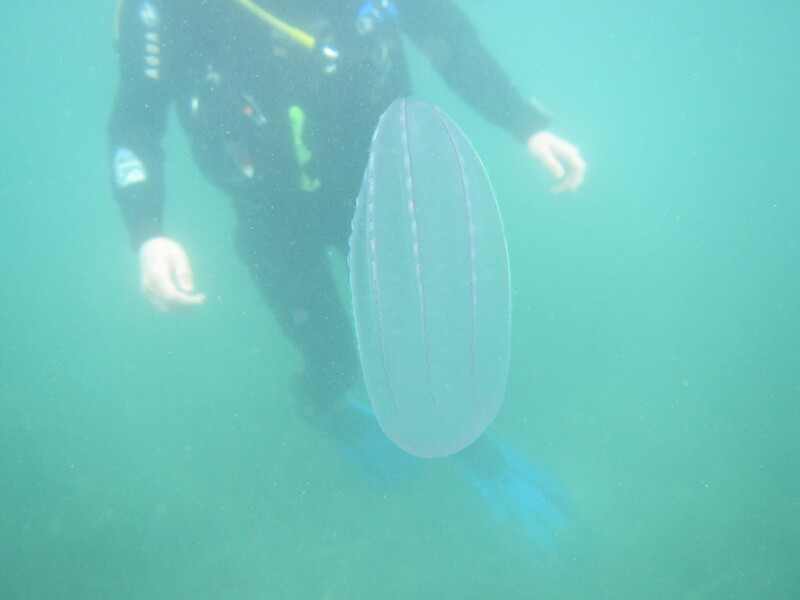 As we got out of the water, we saw a Comb jelly Beroe cucumis, very pretty but hard to photograph. The next dive will have to wait two weeks or so, but then I hope to finally play around with my GoPro.